Deadworld is a superstitious theme that consists of high intensity entertainment through a battle against an army of aggressive zombies. Like all zombie warfare, it will have you on the edge of your seat with high impact graphics to project a realistic battle of the dead! The theme is inspired from the comic book, also called Deadworld. For those who have not read the comic, the zombies to look out for in this theme include: The Mummy, The Mexican, Spoke and Bikini Girl. 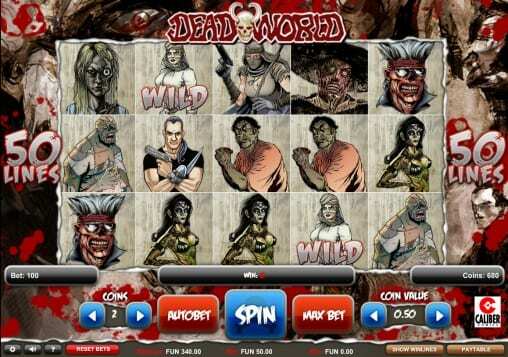 This slightly casual slant to the zombies provides an ever-encompassing ride of entertainment, to your journey of winning some great rewards on this online slot game. Start your bet from 0.5 coins a spin! Oh, don’t worry about enduring this battle of blood-shed and gore alone as there are people fighting for the same zombies out there, with in this game (look out for: The Veiled Assassin, Tribal and Pony – Tail. Get ready to start fighting the dead on this fun online slot today! 1x2 are based in the United Kingdom (Brighton) and since 2003, they have been carving their mark in the online slot game industry. Although they keep things small, 1x2 focus on traditional, 5-reel slot games. They concentrate on delivering entertainment through good quality themes, specialising in virtual sports gaming as well as slot games. Other work includes constructing casino games using Flash and HTML5. Head to WS for more online slots by 1x2. It is all go from the get-go! 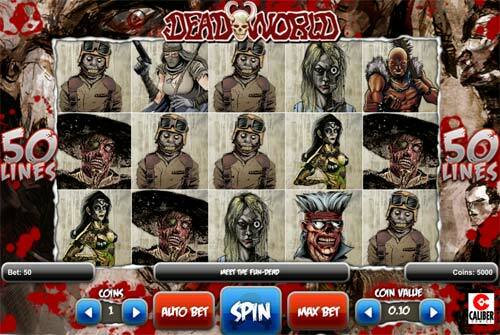 Find the other zombie killers to win some big rewards, up to 750x initial bet line. The biggest reward will be given for killing the creepy skeletons earning players up to 1,000x their bet line, a modest reward. Players can win up to 45x your line bet for killing the Mexican, the Mummy will reward up to 60x, 70x for the Bikini Girl. Then keep an eye out for Spike for a 300x reward and better again 500x for Queasy Rider! The zombie wild will take over other symbols and increase winning lines. The Hagravens can be collected to increase the size of the winnings (up to 300 x total bet). There are also 6 bullet bonus rounds where you can fire away at the evil dead and earn a prize for each zombie defeated. Simply load your gun and kill as many zombies as you can, with each zombie revealing a prize. Players can set their stakes, choosing from 50 pay lines, 1 to 5 coins and a coin value between 0.01 and 0.5 coins. This is a great online slot game because provides high-quality entertainment through an immersive theme that can fill players with a sense of adventure. It’s lots of bloodshed, brains and goriness throughout the spins but it is worth it as there are some good winnings to be had. The bonus rounds will increase the winnings and keep things interesting. So, load your gun and get your eyes peeled and brain focused to fight the treacherous zombie apocalypse! Or head to Cosmic Crystals for some out of this world fun!